Although Season 3 of Lost received a somewhat mixed reception, by the time its fourth season rolled around the show was well and truly back on track. Season 5 continues this run of strong writing and gripping storylines, and has proven a firm favourite with critics and fans alike. Aficionados will recall that Season 4 ended with the island apparently vanishing into thin air. Some of the survivors, the so-called ‘Oceanic Six’, made their way back to civilisation, while the rest of the Lostees seemingly disappeared with the island. Neither group is having a particularly enjoyable time of it. The Six are struggling with addiction, mental illness and legal woes, while the group that remained on the island are trapped in some sort of limbo, erratically travelling backwards and forwards through time with little in the way of apparent control over proceedings. That such a concept can not only seem enjoyable but also feasible is a testament to the skill of Lost’s writers and key creatives. Though plenty of mind-bending scenarios play out of the course of the show’s fifth season, it never degenerates into silly sci-fi or overly complex theoretical mumbo jumbo. Rather the efforts of Jack, Sun, Hurley, Kate, Sayid and Ben to return to the island come across as heartfelt and compelling, and the time travel aspect offers up some arresting and truly unexpected plot twists. 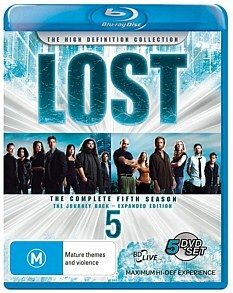 With the show’s sixth and final season premiering in the US in early February 2010, fans who haven’t yet caught Season 5 in its entirety will want to do so without further ado, and this crystal clear and feature-laden Blu-ray set is definitely the way to do it! Lots of bang for your buck, and without doubt a hi-def release worthy of this imaginative and highly regarded show. Ambitious television at its finest. Season Play - A brilliant Blu-ray exclusive feature that allows viewers to keep track of exactly where they finished watching using reminders and on-screen information. Even allows you to indicate which episode you’ve watched with a particular person!